"Orange marmalade and soy sauce mix with Swanson® Chicken Stock to make an unforgettable sauce that coats stir-fried chicken and crisp vegetables." 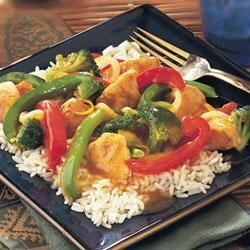 Use a combination of broccoli flowerets, red and/or green pepper strips and sliced onions. For Extra Flavorful Rice: Cook the rice in Swanson® Chicken Broth instead of water. Nice zesty orange flavour. Next time I will use less chicken stock mixture, as there was too much sauce. excellent flavor, but too much sauce. had to add more corn starch to thicken it down more, and scooped some out to throw away. next time, i will try reducing the sauce mixture by 50%.